Ever since its big reveal at E3 last year, there has been a lot of discussion about the pricing of the Nintendo 3DS. With the release dates, launch titles and prices recently being announced, the price of the 3DS is now more topical than ever. Many people are saying that the 3DS, along with the games, are just too expensive, and they won’t be purchasing them for that reason. Well, let’s have a look at how the 3DS shapes up cost-wise around the world and when compared to past Nintendo consoles. In the United States, the 3DS is slated at the price of $249.99 US dollars, which – according to America’s citizens – is far too expensive. That’s a fair argument in many regards, given that the original DS was $100 cheaper at $149.99, and the DSi XL is only $179.99. Interestingly, the Wii debuted at the exact same price of $249.99 in the US, but that didn’t receive as much objection. Simple reason being that was a home console, but the Nintendo 3DS is only a portable. I’m sorry, but what did I just say? “Only a portable”. That may be true, but this portable, as I’ve said before, is so powerful for a handheld that it is like a portable Wii. When you have experienced what the 3DS has to offer, it doesn’t seem so unreasonably priced. Let’s not get all caught up in America being the center of the world though, because it is after all, just one place. Let’s have a look at Australian 3DS pricing. At launch they’re slated for a cost of $349.95 Australian dollars, which is $150 more expensive than the original DS. I also recall that my Wii was just shy of $400, so this portable isn’t as expensive as the home console in Australia. Now the first thing to clarify here is the exchange rate between the US and AU dollars. The Australian dollar isn’t a weak dollar, in fact, $349.95 Australian currently buys $349.60 USD. What that means is that Nintendo gamers in Australia literally have to pay $100 more than those in the United States for the 3DS. The US doesn’t have it so bad after all. The logic behind these pricing decisions from Nintendo is not your usual demand and supply forces. Typically the price would be determined by Nintendo’s ability to supply the product, relative to the demand there is for it. Not in this case. What we have here is what economists call ‘market power’ – an instance where the market fails to set an effective price that is based around the euqilibrium of demand and supply. Because Nintendo is the only company that can make the 3DS and there is no direct competition, they can choose any price that they desire. 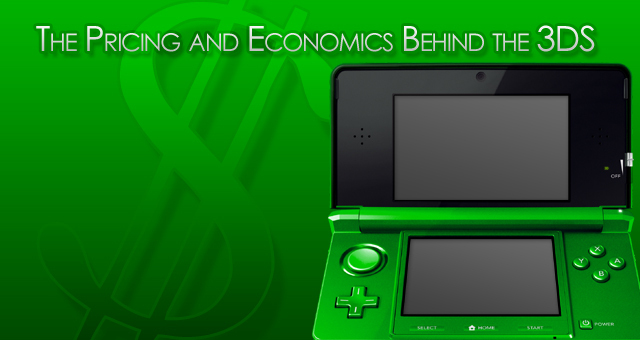 Instead of demand and supply determining the price, it is more an assessment of potential risks and reward that has decided the price of the Nintendo 3DS. The 3DS is not an easy thing to market, and Nintendo has done a great job with it, I’ll give them that. With the whole notion that you have to see it to believe it and the fact that not everyone can see the 3D, there is a fair amount of risk in selling the 3DS. Given the expenses to produce the console, if the 3D gaming concept doesn’t really take off, Nintendo could be in for a significant loss. Hence, they boost the price to get more of a return on the sales that they do make. Now consider smaller and remoter markets like Australia. With a population of around only 25 million people, we are a higher risk market to sell to. The gaming market is much smaller than in North America, and there is less potential for sales. Hence, Australians have to pay $100 more for their 3DSs so that Nintendo makes a larger return on the limited sales that they do make. It is for similar reasons to this that many titles don’t make it out to Australia, because producers don’t see a market for it. Yeah, this might all seem like annoying mumbo jumbo, but it is business. I have said many times before that Nintendo is about the gaming experience moreso than Sony and Microsoft, but like any company, profit is a major motivating factor. Canada has a similar sized population to Australia, however they have a similar 3DS price to those in the US. This is because Canada is considered a part of the North American market along with the United States, meaning that the gaming market in that area is much larger than it is in remote Australia. What about elsewhere in the world? It’s hard to get an idea of exactly what the 3DS will go for in Europe given that it is up to individual retailers; however it is expected to be around the equivalent of $330 to $360 USD. In Japan the 3DS is going for JP¥25,000, which converts to about $300 USD. So what’s the point here? I hear a lot of complaining from Americans that the 3DS is too expensive in the US. While it may be moreso than previous consoles, the US actually gets the 3DS cheaper than anywhere else in the world, so be thankful for that. The President of Nintendo of America, Reggie Fils-Aime has announced that 3DS games will be around $35-$45 in the US, which is pretty reasonable, being much the same as DS titles. So be thankful that the games aren’t up closer to $70 USD, which they are sure to be above in Australia and elsewhere in the world – due to the ‘smaller market’ reasoning mentioned earlier. What it really comes down to is a collection of pretty simple factors. Firstly we have no idea how much each of these consoles costs Nintendo to make, and given all of their features, it wouldn’t be cheap. Secondly we have to consider what we are getting. It is everything the DSi is, plus a wealth of added features on top of just being 3D, like the eShop and a collection of pre-installed software larger than ever before. If you want to consider value for money, the 3DS really has at least $100 worth of new features over the DS, which are worth the cost in my opinion. The 3DS may be one of the most expensive things we’ve seen in gaming yet, but it is going to be worth it. Gaming is an expensive hobby, but it is also worth it. Can we really put a price on the amount of fun we are going to get out of the 3DS? I didn’t think so.